We are a small home-based business, based in Cascade, MT, with a flagship product that we are very proud of; our wickless candle. We are committed to having satisfied customers. If you feel that your candle or any of our products is defective, or you just have questions, please contact us, we will be happy to help. Our products are not sold in any chain stores. In addition to our website, we have booths at various fairs & craft shows, and we have independent sales representatives in several states that sell our candles by hosting home parties. Please contact us if your interested in being a sales representative. What is a Wickless Candle? Our Wickless Candles are very unique! They have a stronger fragrance & last longer than an ordinary burning candle. There is no wick, so there is no flame. The wax does not evaporate with use. Just put the candle on a warmer, melting the specially blended wax, & enjoy the fragrance! When the fragrance begins to mellow, you simply add drops of fragrance oil to your candle. If fragrance is maintained, your candle should last you many years. Besides your home, these candles are perfect to use in offices, classrooms, nursing homes, dorms, & many other places where a normal burning candle is not allowed. If you prefer using the scented wax cubes, check out our newest line called Scentsible Scentsations! These wax cubes use the same special blend of wax as our jar candles, so the fragrance can be refreshed as needed. A huge savings from having to buy the same fragrance cubes over and over again! Montana Huckleberry, one of our best sellers! 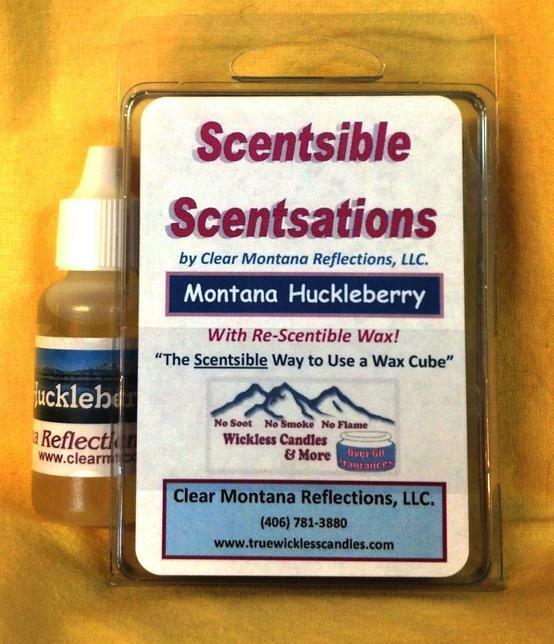 "The Scentsible Way to use a Wax Cube"
Welcome to Clear Montana Reflections!!! We hope you enjoy visiting our website. we are happy to take phone orders If you use FaceBook, there is a link below to take you to our page. Thanks for checking us out!